Bronze is preferable to plastic for wooden hulls because the expansion of wood could damage a plastic transducer and cause a leak. Installation of a stainless steel housing in a metal hull requires an insulating fairing. Transom mounts adjust to transom angles from 3� � 16�. For angles greater than 16�, a tapered plastic, wood or metal shim will be needed. However, the transducer should be adjusted so it is angled slightly forward when the boat is in the water. 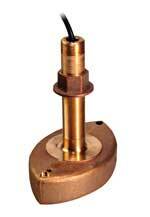 These transducers will generally come in two configurations based on your hull type, a 12� and 20� version. Select a 12� tilt when the deadrise of your hull falls in the 8� to 15� range. Select the 20� tilt if your hull's deadrise is in the 16� to 24� range.